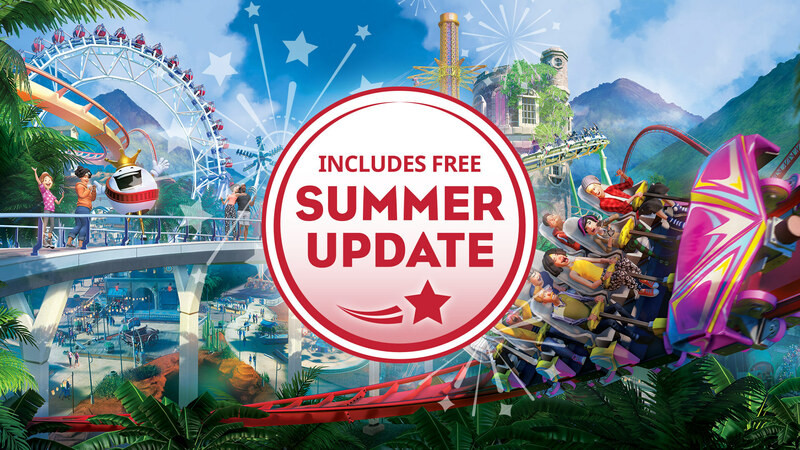 Our wonderful Summer Update is now LIVE! After showing you the live build last week and teasing you with beautiful images of fireworks and billboards, the 1.3 update is now available for download – if you already own the game, it will automatically roll out to you via Steam. Aside from fireworks and billboards, we have eight new coasters and rides, three new Scenarios, a new Stars and Stripes scenery set, the option to trigger rides, custom biomes, and more! We can’t wait to see what you come up with, from fireworks shows to relaxed summer scenes! Keep your eyes peeled for more info on our upcoming fireworks competition, join us on YouTube (Wednesday 7PM BST), Twitch (Tuesday 1PM BST) and Facebook Live (Friday 2:30PM BST), and send us your creations at community@frontier.co.uk! Please enjoy the full Update Notes below! Hi !!! how to update please ??? Great game and the devs are awesome. This is how game companies should do things. I need first person free roaming role playing mode! This is how devs should do games. This game with each update is getting more and more popular with the user base growing daily. Planet Coaster as well as Cities Skylines are two amazing examples of games that are being done perfectly. Thank you Frontier for keeping up the amazing work. Thanks for the update. This, again, is amazing. Top devs. Other game developers should take note of these guys. This is how things should be done with updates and getting issues sorted. Lots of free stuff too........I like free stuff! I still want water though where I can make realistic water features, pretty please!